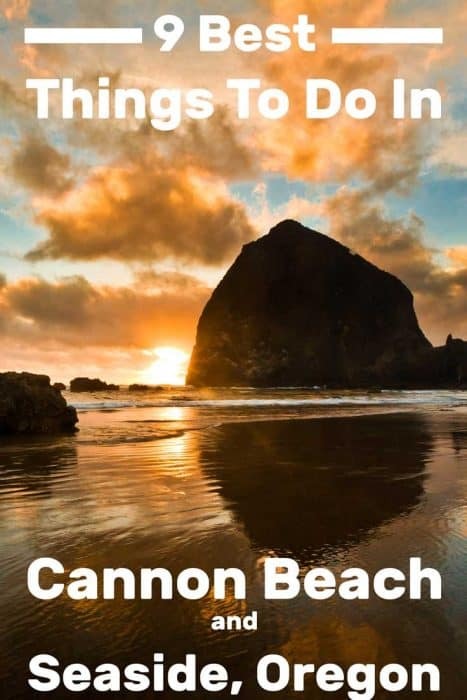 Continuing today with our journey along the Oregon Coast – or rather the series of posts about the awesome places along the Oregon Coast – it’s time to stop and take a look at Cannon Beach and Seaside. While these two towns are separate from one another, they are very close. You could drive from one to the other in under 15 minutes. It just makes sense to visit them together (and include them in a single post). We’ve visited the area twice already and I’m sure we’ll be back. We’ve hiked in Oswald West State Park and Ecola State Park, visited Haystack Rock and enjoyed the views from the Seaside Promenade, there’s plenty that we haven’t seen and done yet. So, this post is for us as much as it is for readers of the blog! I’m sure we’ll be back to explore this section of the coast in the future and we intend to check each and every item off this list! Keep reading for more detailed information on each of these attractions, including the cost, hours of operation, and links to the attraction’s websites if applicable. 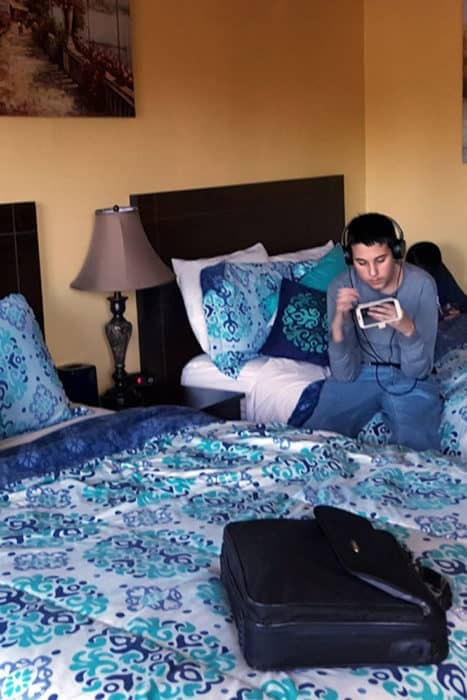 In addition, I have included a list of the best places to stay while enjoying the top things to do in the area at the end of this post. 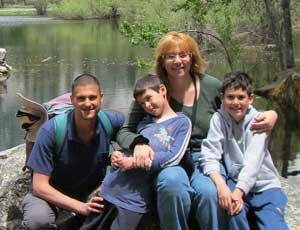 This park is known for its’ numerous trails and overlooks. There are four separate parking lots allowing you to choose where to park based on which trail(s) you would like to explore. A short hike allows you to get a view of one of the best-preserved coastal rainforests in the state. 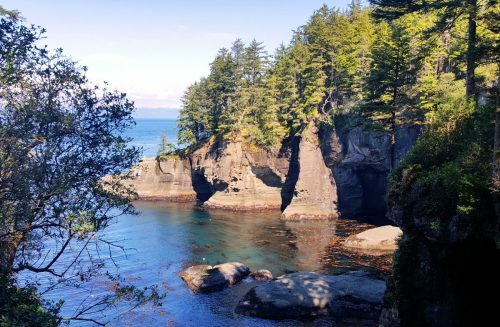 There are short hikes, like the Short Sand Beach Trail which takes you a ½ mile through the woods and ends at the beach. Or Old Growth Forest Trail which is only .2 miles long is easily accessible and gives you a view of the coastal rainforest. For those of you wanting a more moderate to difficult trek through the woods, there are trails for you too! Cape Falcon Trail is 2.5 miles long and provides hikers with an opportunity to view Short Sand Beach from an overlook. 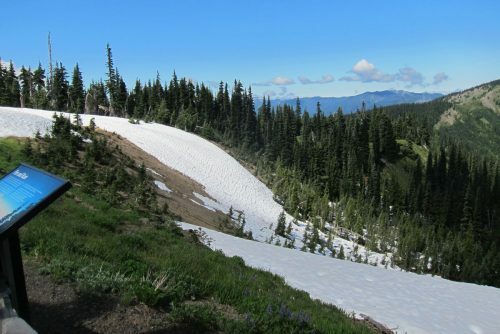 There is also the much longer Neah-Kah-Nie Mountain trail which has a north and south trailhead. 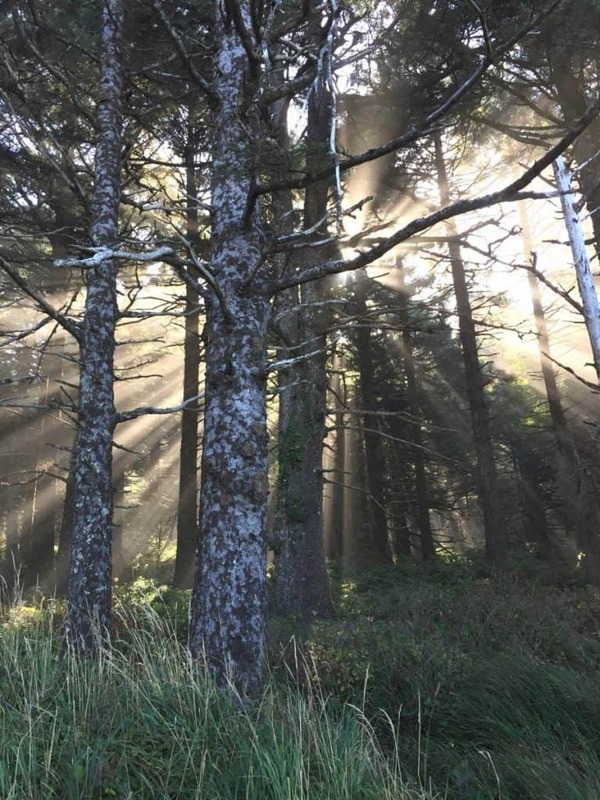 For more detailed information on these hikes and the many others available at Oswald West State Park, you can view this brochure. The park itself is open year-round and there is no cost to exploring all you want. Visitors say to just make sure you leave before it is too dark to make it back to your vehicle! 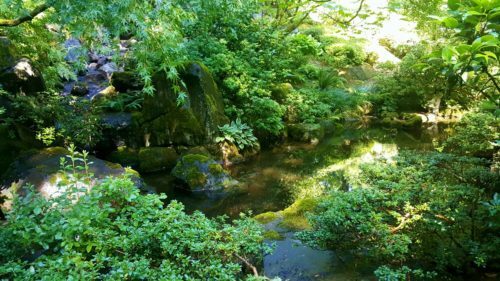 While this park is 5 miles south of Cannon Beach, it is worth the visit! This is a free beach and it is open year-round. At low tide, you can walk down the beach north of the parking area and find the wheel ruts carved into the rock from stagecoaches long ago. There are two caves around the point where visitors like to explore and look at the tidepools left from the tide going out. 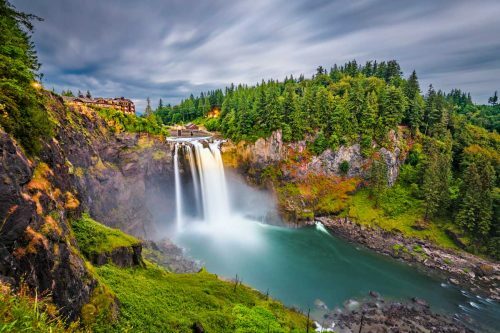 There is a waterfall that can be seen when the snow melts, or during particularly rainy times. Or, many visitors just come to enjoy the forested picnic areas and the beach. Visitors warn to make sure you are aware of tide information when exploring the beaches and headlands here because you could become stranded if the tide comes in while you are out at the point! For up to date information on this, you can go to this website. 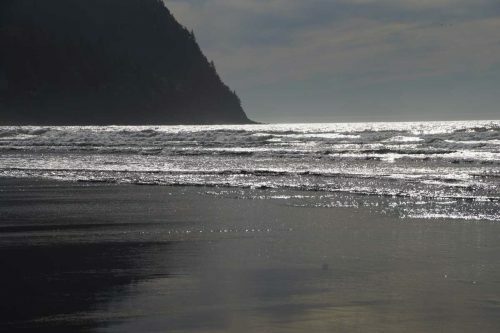 Just one mile south of Cannon Beach, Arcadia State Recreation Site boasts a beautiful beach that stretches more than a mile. It is a great location for relaxing and soaking up some sun. In addition, it is known to have good surf, if you are into that! If relaxing on the beach isn’t your idea of a good time, Arcadia also offers you a chance to explore tidepools and some other attractions. To the north, lies Humbug Point which has a great view of Lion Rock. Lion Rock is a rock island just off the coast. Many visitors love taking photographs of the rocky outcrop, especially at sunsets! If you time your visit during low tide and are willing to walk about half a mile further north, you can see Silver Point. This headland was aptly named for the color of the weathered spruce trees along the bluff. This little piece of seaside is free to visit and open year-round. For more detailed information, including history and interesting information about the formation of the bluffs you can check out their website. There is also a tide table for the area available here. 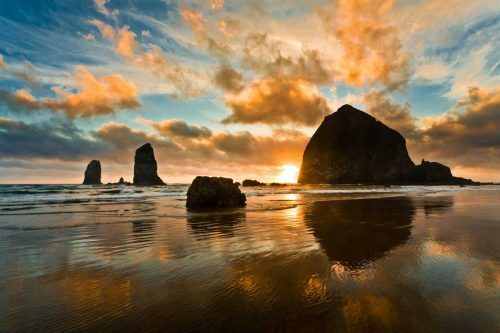 Known as one of the Oregon Coast’s most recognizable attractions, Haystack Rock is one stop you have to make! 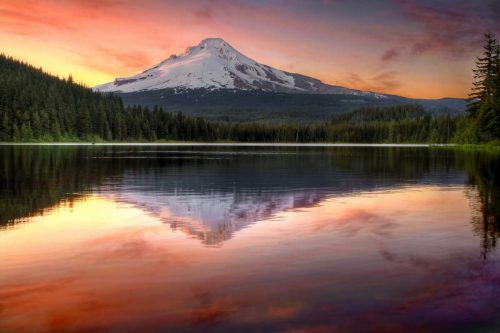 It was formed millions of years ago by lava flows and is now a part of the Oregon Islands National Wildlife Refuge. This rock rises 235 feet above the shoreline, and at low tide, you can walk out to view the colorful sea stars and other tidepool creatures caught in the intertidal area. From early spring to mid-summer, Tufted Puffins and many other birds can be viewed. 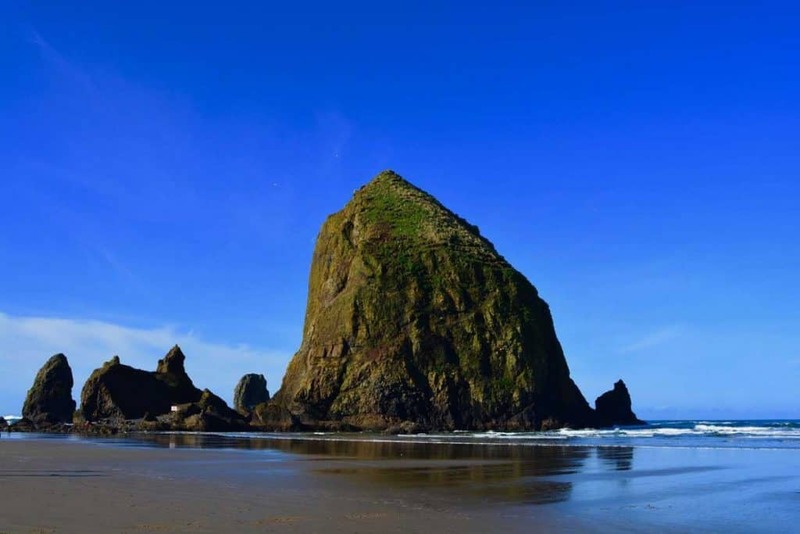 There are educational programs presented by The Haystack Rock Awareness Program from February to October. If your trip falls outside of this timeframe then you can still go to this website to get information all about the tidepools and the animals you can encounter when visiting. This park is a fantastic location to do many different activities including tidepooling, surfing, hiking, picnicking, and wildlife observing! 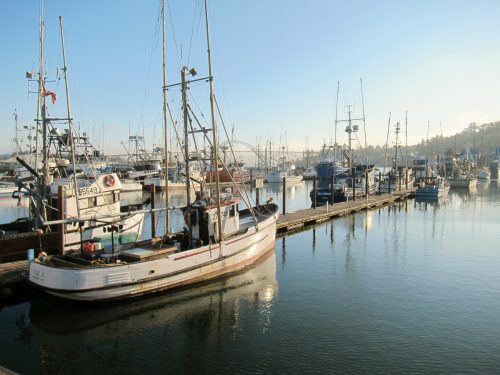 It includes over 1,000 acres and 9 miles of coastline wrapping around Tillamook Head. 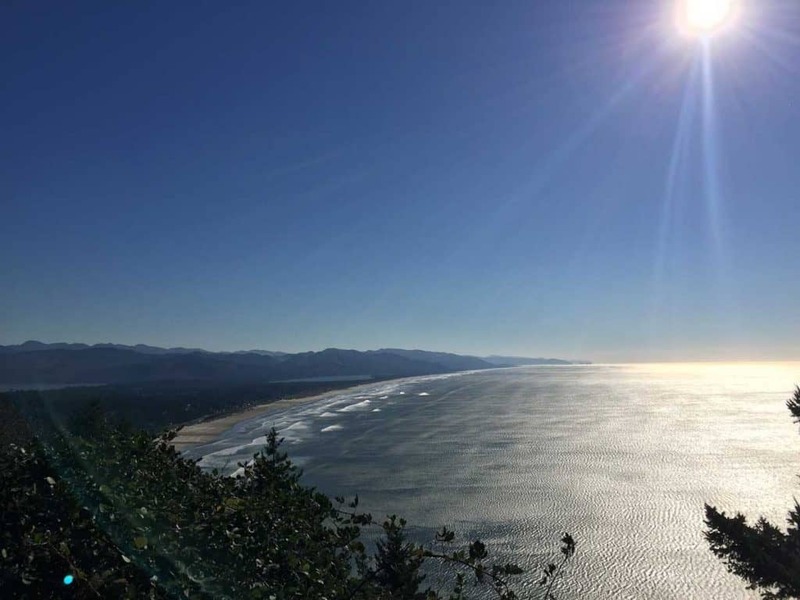 There are many trails the park is known for, including the Tillamook Head Traverse Hike. This trail follows the Corps of Discovery’s route (the Lewis & Clark expedition) back in 1806 when they were searching for a beached whale! Visitors today agree with Clark’s evaluation of the view being spectacular. 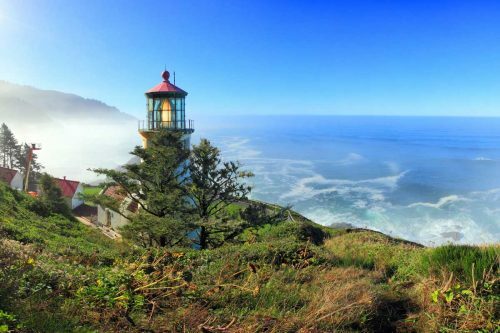 When you look out at the beach from Tillamook Head, you can see Tillamook Rock Lighthouse. This lighthouse dates back to 1880 and has withstood many devastating storms. Today, the lighthouse is not functional and visitors cannot access it, but viewing it gives a glimpse back in time. 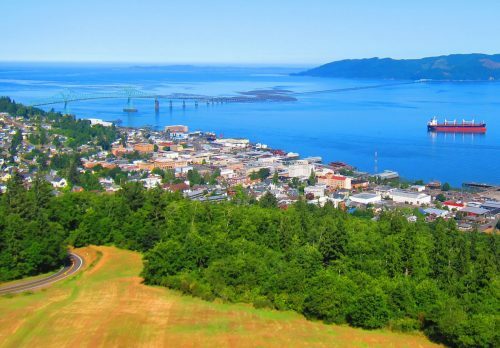 In addition, there is an 8-mile segment of the Oregon Coast Trail and a 2.5-mile historical interpretive route called the Clatsop Loop Trail. 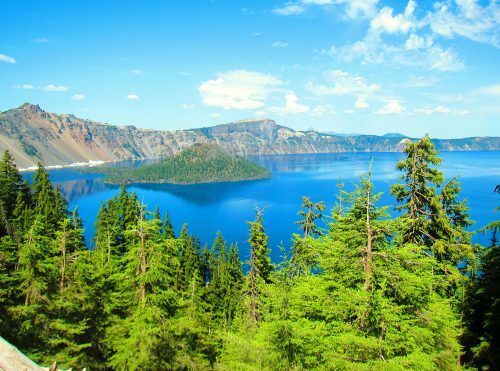 This brochure lists the different scenic trails you can take, as well as the surface type and length of each so that you can pick one that matches your level of ability. Indian Beach is a secluded sandy beach that surfers like to frequent. It is also good for anyone wanting a chance to check out the tide pools, or just lay back and soak up some sun on the sand. Many visitors have been able to spot migrating gray whales in the winter and spring from here too! The park is open year-round and for a one-day use parking permit the cost is $5, they do have other options for people wanting to visit more often so you can check their website for more detailed information. Their website also lists park advisories and different events that might be taking place during your visit. 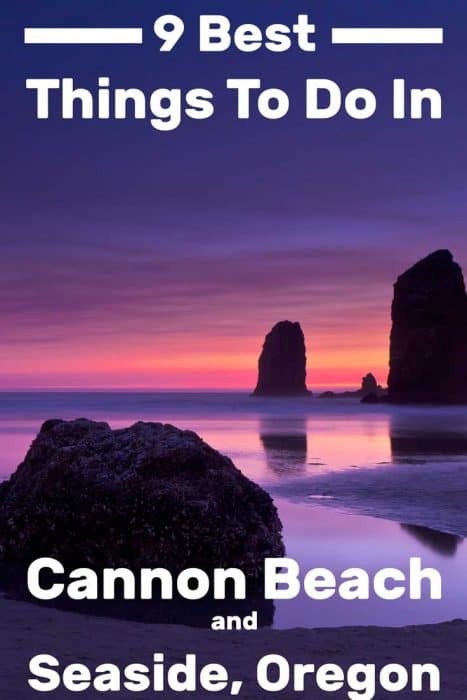 Here are a couple of the best locations to stay during your visit to Cannon Beach. I have included links to the locations from my favorite travel reservation website, www.booking.com. Stephanie Inn Not only is this hotel oceanfront, it also offers a free shuttle to downtown Cannon Beach. 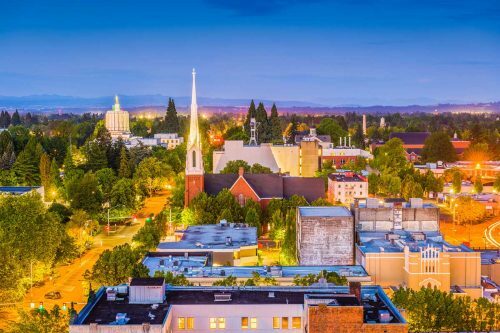 It is the highest rated location, most visitors really enjoy the wine tastings, the free cookies, and their room’s fireplace and whirlpool tub. Sea Breeze Court If you are looking for a place to stay with a more economical price, this is the place for you. 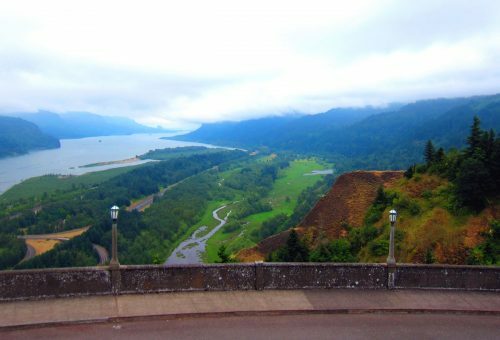 It just happens to also be one of the highest rated locations in Cannon Beach. It is centrally located and has suites with full kitchens if you want that kind of thing! While not a large location, or an interactive attraction, the Lewis and Clark Salt Cairn Monument is a stop worth making if you enjoy history at all. The cairn, or pile of rocks, marks the location where it is suspected members of the Lewis and Clark Expedition traveled to make salt. These three men traveled to Seaside from Fort Clatsop (near Astoria) at the start of January 1806 until the end of February that same year. 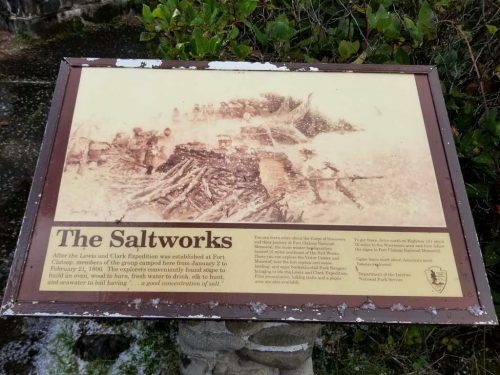 Their goal was to extract salt from the seawater to bring back to Fort Clatsop. This was integral to the expedition because salt was used to cure meat for preservation. Visitors suggest this is a great stop for families or anyone that is into history. It is easily accessible off the promenade and free to the public 24 hours a day, 7 days a week. This is literally a turnaround right where a street dead-ends at Seaside Beach. Instead of making it a boring location, they have built it up to a wonderful addition to the Seaside promenade. Locals say it is always busy and full of people enjoying the location. This location allows visitors a chance to sit on one of the many benches and enjoy the view of Seaside Beach from a paved area. The Turnaround is lit in the evenings to give it a romantic feel while not distracting from the view. 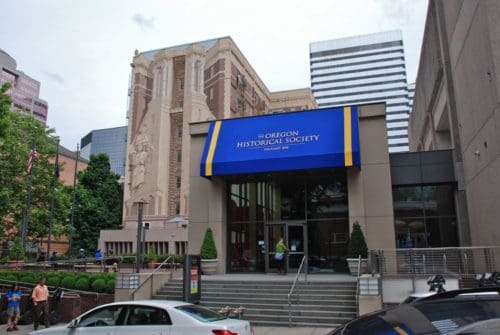 It is open to the public 24 hours a day, 7 days a week for free. 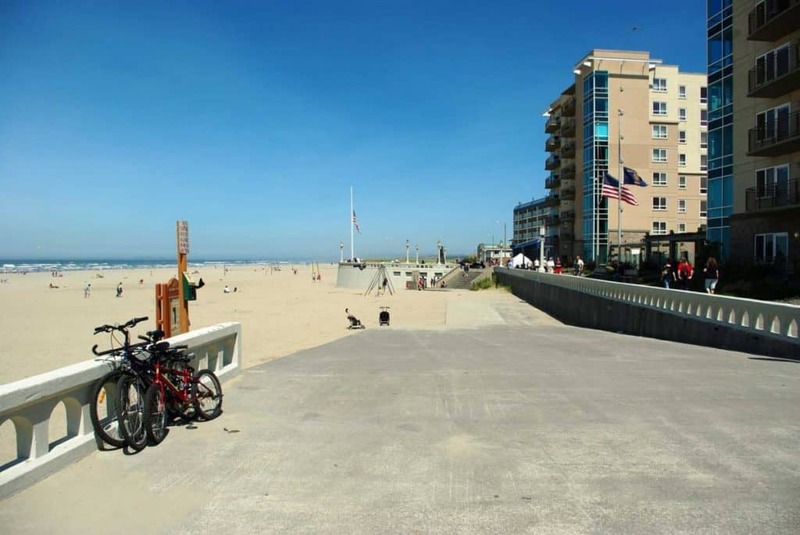 The promenade is built along Seaside Beach, a wide and open sandy beach and the site of Oregon’s first seashore resort. Locals call it the “Prom” and frequent the location for walking and enjoying the local flavor of Seaside. It is about a mile and a half long, 15-feet wide, and paved making it easily accessible for people from all walks of life. The Prom is the perfect location for biking, running, or just casually strolling along the beach. 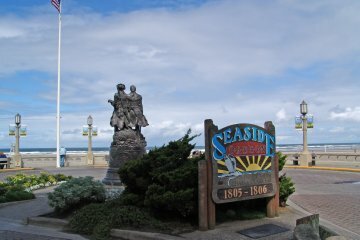 It also offers many different oceanfront dining options, so it makes a wonderful part of Seaside, Oregon. If you enjoy walking and taking in a place’s culture, I would suggest parking at the north end of the Prom (around 12th Avenue). You can then visit the Seaside Aquarium (#9 on this list) prior to walking along the Prom. Toward the south end is the Turnaround (#7 on this list), a good place to sit and relax before the walk back to your car. If you are planning to visit in August, be ready! The beach is the sight of the world’s largest beach volleyball tournament. More than 1,000 teams play on over 100 courts. This is usually a fairly busy location, but during this tournament, it becomes borderline hectic. 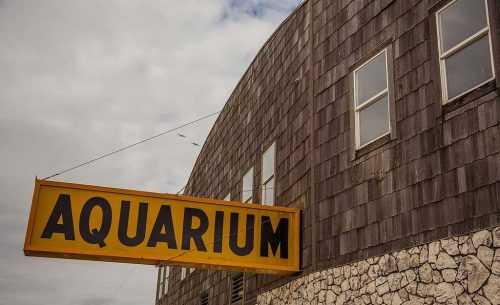 One of the oldest aquariums on the West Coast, the Seaside Aquarium has been in operation since 1937. It is a bit on the small side, but it is the perfect chance to get a more in-depth perspective of the sea. Oh, and did I mention the seals? They have an entire family of seals! The Aquarium has one of the best records in the world for the captive breeding of Harbor Seals. Currently, there are 11 different seals that call the aquarium their home. They play around and enjoy their tanks while you watch and enjoy their antics. In addition, they have recently opened a Discovery Center that allows visitors to explore sea life in a more up-close way. You can touch different aquatic life in the “Touch Tank,” anything from a starfish to sea urchins. There are also microscopes that you can use to get a better look at the tiniest of sea life. The Seaside Aquarium is available to visit year-round and the doors open at 9 am. Their closing time changes with the seasons, and up to date information can be found online. The cost of admission is $8.50 for adults and $4.25 for children ages 6-13. There is more detailed information available on their website if you want specific information about admission or closing times. Here are a couple of great places to stay if you want to stopover in Seaside. The links here are to www.booking.com since it is my go-to place to find the best places to stay anywhere I travel. Lanai at the Cove This condo hotel offers oceanside views is pet-friendly and has a swimming pool open seasonally. It is also the highest rated location in Seaside. Sandy Cove Inn This family-owned motel is a quick 2-minute walk to the beach. This is the lowest price option with the highest ratings on booking.com, so it is definitely a good option! I hope you found this guide handy. If you have any questions about the area, let me know and if you have more suggestions based on your own visits to the region, please do add a comment as well. Happy travels!